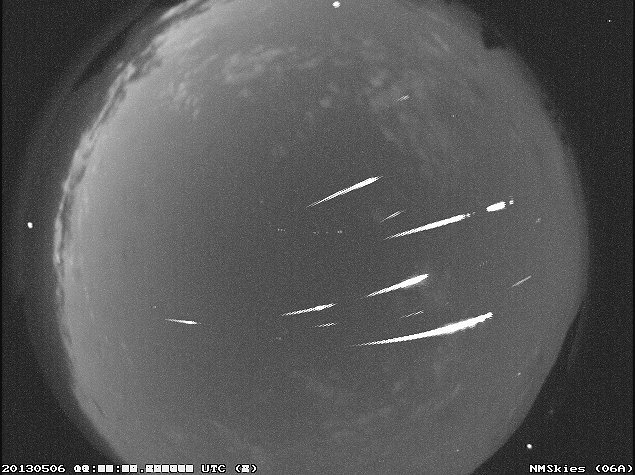 A composite image of 13 Eta Aquarid meteors from the NASA All Sky Fireball Network station in Mayhill, New Mexico the morning of May 6, 2013. Clouds seriously hampered our view of the ETAs this year. Observations reported to the International Meteor Organization indicate an outburst in the early hours of May 6th UTC. Despite interference from the moon and clouds (and rising sun! 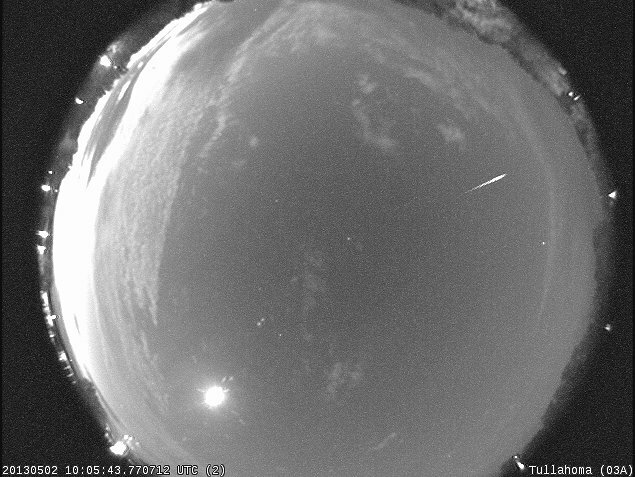 ), this morning we snagged our first observations of the 2013 Eta Aquarids. Here’s an image of one from the all sky camera in Tullahoma, Tennessee. The Eta Aquarids peak in the pre-dawn hours on May 6 and are material from Halley’s comet. They zoom around the solar system at speeds near 148,000 mph. The one seen here burned up completely in our atmosphere over Nunnelly, Tennessee at a height of 58.7 miles above the ground.